I was briefly reminded of this when playing through one of the games from the ongoing US Junior Championship in Saint Louis. In the second round, Kayden Troff had the white pieces against IM Daniel Naroditsky, and the game started out as a King’s Indian: 1.d4 g6 2.c4 Bg7 3.Nc3 d6 4.e4 Nf6 5.f4. I’m no expert on this line – I don’t play the KID as black, and I don’t play the 4 Pawns Attack as White – but Black’s next move was definitely new to me. Naroditsky played 5…Bg4! ?, and it looks pretty interesting. 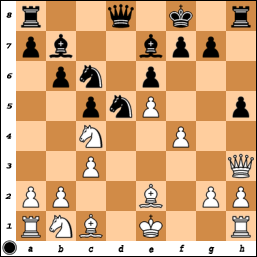 I have seen the 4 Pawns Attack transpose to a Benoni-like position before with 5…0-0 6.Nf3 c5 7.d5 e6 8.Be2 exd5 9.cxd5. 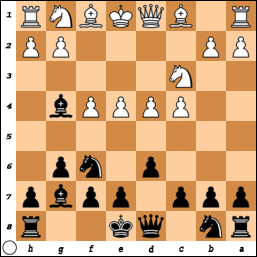 There, Black often plays …Bg4 (and later exchanges on f3), as the light-squared bishop is a typical problem piece in the Benoni, while the removal of the Nf3 makes it harder for White to play for e4-e5 later on. So maybe 6.Nf3 would only lead to something like that, but I think Black might also have a different idea. After 6.Nf3 Bxf3 7.Qxf3 Nc6, there are some issues with the d4-pawn. After 8.Nge2 e5, maybe Black is on his way to equalizing. I’m not totally sure, though. Anyways, Troff could’ve used that Wu-Tang warning to think first. My last couple posts didn’t have any chess positions in them, but the Candidates Cycle debate has pretty much ended on its own, so back to some actual games. A couple days ago, I was talking to somebody who brought up a game I played against a then-untitled David Pruess at an IM-norm event in 2000. Like a number of our games, this one is probably not suitable for young children (cover your eyes! ), as we reached a totally irrational position where David put piece after piece en prise. It’s already funky, as what could have been a normal King’s Indian Attack (KIA) against a Sicilian with 2…e6 left the reservation on move 6. Black should get his queenside going with 13…b5 here, as he’d have some plus after 14.Nca3 (14.Ne3 drops the f4-pawn) b4 15.Nc2 bxc3. Black’s given up the right to castle, but the rest of his pieces make some sense, which is more than you can say about their White counterparts. In the comments section there, Dan Schmidt suggested that using the draw-odds/extra-white might not combine to create a scenario in which the draw-odds advantage was not overly large. Someone posted a link to that entry on the ChessPub forums, and “Symslov_Fan” responded along similar lines, saying that the draw-odds advantage is too large. At the time of my first post, I hadn’t done any simulations to figure out what sample odds might be in such a scenario, but I began doing that last week. Then David Krantz (a statistics professor at Columbia) had an article published on ChessVibes that looked in more detail at some stuff I was just doing myself. His article can be seen here.